This performance (recorded by the very gracious “jazze1947”) comes from Aneby, Sweden, on Feb. 7, 2012. The Camels are Bent Persson, trumpet; Göran Eriksson, alto / clarinet; Stephan Lindsein, trombone; Claes Brodda, clarinet / baritone / tenor; Lasse Lindbäck. string bass; Ulf Lindberg, piano; Sigge Delert, drums; Göran Stachewsky. guitar / banjo. The Soundies — a kind of early video jukebox — seem very primitive today. Watch more than two at a time by the same band, and it’s clear they were done rapidly, cheaply, and without much emphasis on variety. The same sets and presentation continue throughout a series, and the musicians are clearly miming to a pre-recorded soundtrack. But how else would we see Henry “Red” Allen and his sidekick J. C. Higginbotham in performance in 1946? This Soundie — HOUSE ON 52nd STREET — was not intended as a follow-up to Red’s moody THERE’S A HOUSE IN HARLEM, but it seems an extension of songs like GIMME A PIGFOOT and THE JOINT IS JUMPIN’ — efforts to invent a party scene in less than three minutes. Its rather thin melody and lyrics already must have seemed nostalgic for a scene rapidly slipping away. By 1946, I think “the Street” was in decline: the returning servicemen had already decided to take their girlfriends to the suburbs, own some lawn, raise families — and I do not scoff at these activities, for they delineate aspects of my early life . . . but domesticity meant that you didn’t stay up late listening to jazz in the city. And then there was television, a few years later . . . 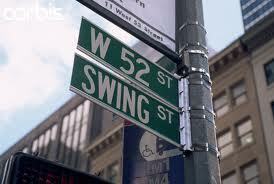 In Manhattan, I believe that the block between Sixth and Seventh Avenues on Fifty-Second Street is called SWING STREET on the green-and-white sign, but that’s possibly the only thing swinging there now. Thanks again to Franz Hoffmann for delving even deeper into his treasure-chest and letting us see and hear these prizes.